FILE - President George H.W. Bush is greeted by Saudi troops and others as he arrives in Dhahran, Saudi Arabia, for a Thanksgiving visit, Nov. 22, 1990. * Before becoming president, George H.W. Bush already had an impressive resume of foreign policy experience having served as director of the Central Intelligence Agency, ambassador to the United Nations, envoy to China, and President Ronald Reagan's vice president. * During his four years in office, Bush earned the respect of the many foreign leaders he had to deal with, including British Prime Minister Margaret Thatcher, German Chancellor Helmut Kohl and French President Francois Mitterrand. * One of Bush's major foreign policy achievements during his four years in office was to steer the United States and its allies through the collapse of the Soviet Union. FILE - U.S. President George H.W. 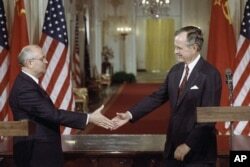 Bush, right, and Soviet President Mikhail Gorbachev shake hands following the signing of accords at the White House in Washington, June 1, 1990. * Bush's crowning foreign policy achievement as president was in organizing an unprecedented international military coalition that reversed Saddam Hussein's invasion of Kuwait. The 1991 war lasted just 100 hours and was a major victory for the United States and its allies. * While a military triumph, the invasion left Hussein in power, and set the stage for a second Iraq War when Bush's son, George W. Bush, invaded Iraq in 2003. Twenty-seven years after the first war with Iraq, U.S. forces are still in the country. * Other notable foreign policy actions Bush took included ordering an attack on Panama in 1989 to overthrow strongman Manuel Noriega. * Elsewhere in Latin American, Bush ended U.S. support for the contra guerrillas in Nicaragua. In exchange for economic aid, the leftist Sandinista government agreed to free elections, and the following year were voted out of power. * Bush was president when China cracked down on demonstrators in Tiananmen Square in June 1989. Bush took a measured response — one that his critics said did not go far enough — in suspending military sales with China, but sending one of his top advisers to Beijing to discuss the situation with Chinese leaders. * Bush's administration also negotiated the North American Free Trade Agreement with Canada and Mexico, a measure that was ratified by the Senate in President Bill Clinton's first term.